I have finally finished my Pomatomus socks. I love them. No, I LOVE them. Prettiest socks I've ever made. Almost the most perfectly knit socks I've ever made. I guess the 2 month wait was worth it. Yarn: Pagewood Farms Yukon sock yarn in Prism colorway. Comments: I LOVE this pattern! 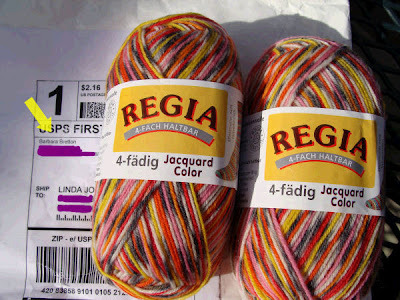 Some Regia I won in a contest on Barbara Bretton's blog. She's a well known author who also knits. I'm going to knit some plain Jane socks with this cos I need a break from the more complicated stuff I've been making the last few months. 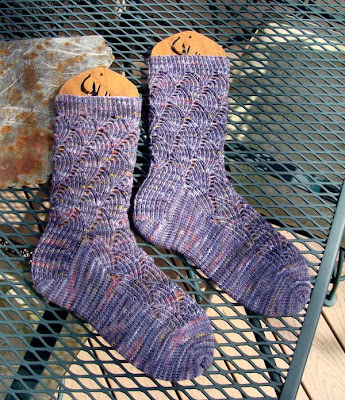 Before I start these, though, I'm going to make some baby socks in leftover purple sock yarn. I joined a little KAL on Ravelry being held by the We Love the Osmonds group. We're making purple baby socks for charity.